After the Newtown, CT school shooting December 14th 2012, discussions about gun control blaze again the US. The sale of handguns and semi-automatic rifles and assault weapons immediately sky rocketed as it usually does after every mass killing. The US has already many more weapons per person than any other country in the world. For West European, Latin American and Asian countries with strict gun control this is an amazing phenomena and hard to understand. In their experience more guns simply means more killings! 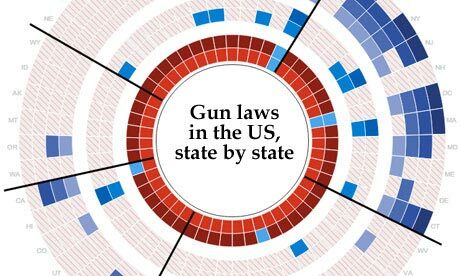 Unfortunately it is not very likely that US federal or state laws regarding gun control are going to change very much in the near future, despite Obama's efforts. One has to fear that ever more guns will be sold to US citizens and that therefore more new and used guns will be trafficked into Latin America. The famous Second Amendment was amended to the US constitution as part of the "Bill of Rights" back in 1791. It is only a short text: "A well regulated Militia, being necessary to the security of a free State, the right of the people to keep and bear Arms, shall not be infringed." At the time, the amendment was meant to legalize armed militias, because no armed professional Police force did exist yet and the 13 states of the federation didn't want a federal permanent army of paid soldiers. Federal and State gun laws have to be in line with the Supreme Court's interpretation of the constitution. In the US, the Supreme Court is the legal body that is entitled to interpret the constitution and thus the Second Amendment. It has done so many times in the 220 years of the existence of this Second Amendment and the Supreme Court even has re-interpreted re-interpretations. Therefore the actual legal interpretation of the Second Amendment by the SC has nothing to do anymore with the original meaning and text of the Second Amendment. Through the years, the Second Amendment has fallen prey to all kind of lobbyists and false sentiments. One could firmly argue that the effect of all these (re-)interpretations is that the Second Amendment simply was re-written by the Supreme Court, which in itself is an unconstitutional act, because the SC can only interpret it! To amend the US constitution, you need two-thirds vote in Congress. For an amendment to be ratified it needs three-fourths of the state legislatures to approve it, or approval by ratifying conventions in three-fourths of the states. Of the thousands of proposals that have been made to amend the US Constitution, only 33 obtained the necessary two-thirds vote in Congress. Of those 33, only 27 amendments (including the Bill of Rights) have been ratified. The proper constitutional way seems to revoke and rewrite the Second Amendment, but this will be a hard nut to crack, because a two-thirds vote in congress is impossible to obtain for any kind of gun control. A recent poll by ABC News/Washington Post showed 54 percent of American respondents support tougher gun control laws. How Do US Guns End Up in Latin America? President Obama in his recent Memorandum, is pushing for a ban on assault weapons and high-capacity ammunition magazines such as those used in Newtown, as well as the closing of a legal loophole that enables people to buy weapons at gun shows without going through background checks. The current state registration process for guns and gun-owners in the US is the first loophole. It's not a federal registration process and therefore it is different in every state. Obama is proposing now a National gun and gun-owner registry. According to the U.S. Bureau of Alcohol, Tobacco, Firearms and Explosives (US ATF) millions of transactions involving the private sale of firearms between the residents of the same state occur each year in the United States at gun shows, and through classified and online advertisements. These private sellers, who are not Federal Firearms Licensees (official gun shops), do not have the ability to use the National Instant Criminal Background Check System (NICS) to conduct background checks on prospective private purchasers and, consequently, have no comprehensive way to confirm whether or not the private individual to whom they are selling a firearm is prohibited from possessing a firearm. Many FFLs throughout the United States have routinely facilitated firearms transfers between private individuals, and FFLs may charge administrative fees to do so consistent with any state law requirements. This service provides both customers and the community assurance that individuals who want to purchase firearms undergo a comprehensive background check. FFL facilitation of private firearm transfers will also improve law enforcement's ability to trace firearms if they are later recovered in a crime. In addition most states do not require the reporting of lost or stolen firearms. Some states do not even have a formal process of revoking licenses or permits once a person becomes ineligible. Laws in states like Idaho and Alaska prohibit authorities from registering firearms or enforcing any local ordinance that regulates the registration of firearms. This loophole is the cause that many fire-arms can be bought by straw purchasers and trafficked into Latin America. In Texas, New Mexico and Arizona, dealers can sell an unlimited number of rifles to anyone with a driver’s license and a clean criminal record without reporting the sales to the government. It is impossible to know how many firearms are illegally smuggled into Mexico in a given year, but about 87 percent of firearms seized by Mexican authorities and traced in the years 2004-2008 originated in the United States and even 90% in the last three years, according to data from US ATF. According to the NYT, sending straw buyers into American stores, cartels have stocked up on semiautomatic AK-47 and AR-15 rifles, converting some to machine guns, investigators in both countries say. They have also bought .50 caliber rifles capable of stopping a car and Belgian pistols able to fire rifle rounds that will penetrate body armor. A review of cases over the last two years shows a pattern: the drug cartels hire people in need of cash with no criminal records to buy guns from legal sources, often just one or two at a time. Once the smugglers have amassed a cache of weapons, they drive them across the border in small batches, stuffed inside spare tires, fastened to undercarriages with zip ties or bubble-wrapped and tucked into vehicle panels. In some cases, the drug traffickers and gun smugglers are linked. US Congress should at least renew the 1994 Assault Weapons Ban (expired in 2004 because of a sunset provision) which would help to prevent traffickers from obtaining the most deadly weapons now arming Mexico’s drug trafficking organizations. The second loophole is the almost open border to Mexico. According to Wikipedia, the US-Mexico border is 2,000 miles long and traverses a variety of terrains, ranging from major urban areas to inhospitable deserts. It is the most frequently crossed international border in the world, with approximately 350 million people legally crossing per year. The border is guarded by more than twenty thousand US border patrol agents, more than any time in its history. However they only have "effective control" of less than 700 miles (1,100 km) of the 1,954 miles (3,145 km) of total border, with an ability to actually prevent or stop illegal entries along 129 miles (208 km) of that border. Obviously the US-side of the US-Mexico border is far better controlled by U.S. Customs and Border Protection than the Mexican side. Everybody crossing the border from San Diego to Tijuana, knows how easy it is. Crossing the other way is much more difficult. El Universal wrote that Mexico's Ministry of Defense seized more than 83,000 weapons in 2010, a vast increase on the less than 6,000 seized in 2007. Mexican customs agents (Servicio de Administracion Tributaria - SAT) have only managed to confiscate a tiny fraction of all weapons smuggled into Mexico. According to Milenio only 1,015 fire-arms were seized during 2005-2010 at the border and an estimated 2,000 weapons cross the border illegally into Mexico every day. In recent years the Mexican Federal Police have been far more successful in confiscating illegal arms than the Mexican customs officers. The US Bureau of Customs and Border Protection has intensified its training efforts with Mexican government entities. A particular effort to accelerate the training involves detection of money, narcotics and firearms and SAT staff using canine units. However, these programs are very small and small budget. Also, the US ATF has launched a program to trace gun trafficking, to be able to detect trafficking routes and trafficking networks. Mexico is one of the toughest countries in the Americas to own a gun legally. There is only one gun store in the entire country, located in Mexico City. Requirements on gun ownership are similar to those in the United States, such as no prior criminal convictions, the mental capacity to operate a gun, an age limit to ownership of 18. But Mexico also requires gun owners to obtain a one-year permit from the Secretariat of National Defense and also a membership of a shooting club. Every gun-owner is required to re-register his gun(s) every year. Even with these restrictions, a large number of Mexicans own firearms. An estimated 15.5 million Mexicans have guns, but only 2.8 million of those guns are registered, according to Gunpolicy.org. Over 50,000 gun retailers are located on the U.S. side of the border and there have been multiple reports of weapons purchased by U.S. buyers ending up in the hands of Mexican drug cartel members. Most of the firearms trafficked from the US will end up in Mexico, but a smaller percentage is trafficked from Florida and will end up in Colombia and other Latin-American countries.